As a mom, I am frustrated when I ask my son what he did at school today and he replies “nothing”. As a Montessori teacher, I’m even more frustrated when I hear my students give that same response to their parents. I want to say “What do you mean you did nothing? 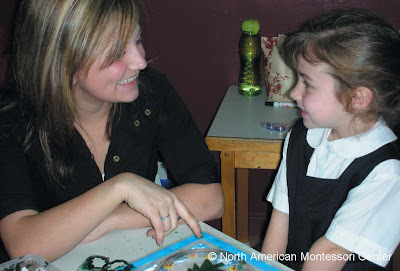 We worked like crazy all day long!” Parents used to come to me asking what their child was doing all day in my Montessori classroom because they couldn't get them to share their experiences at home. I wondered how to elicit more response from both my children and my son and analyzed both the question and the responses. First, we ask our spouse or our friends “How was your day”? They respond with “fine” or “ OK”, and elaborate as they feel the need. So I tried asking my son about his day and he responded in kind, without elaborating. This, I felt, wasn't any better than the “nothing” response I’d gotten before. I realized that children need more direct questioning. They are developing the art of communication and therefore need to be guided through the process. I started asking questions that required more than one word answers. Children often reply that they did nothing all day because they are so busy ‘learning and doing’ that they don’t realize what they are ‘doing’ is important. After all, Montessori said that play is the work of the child. It is only natural then, that they feel that they are working and doing their jobs. Learning that “M” sounds like “mmmm” as in mouse, mat, mug, match, and muffin or learning that the square root of 6 is 36 is just what they’re supposed to be doing. It’s not momentous enough to them to attach daily significance. From the parent’s perspective, dropping the tile box and having to pick up all the pieces did not sound like the best part of any day. However, from the child’s point of view, it was the catalyst that started a series of positive events. Hint: This is a good thing to do at the dinner table. As you’re eating, go around the table and each family member can tell the best and worst parts of their day. If you ask for the worst parts first, then you can end on a positive note. One afternoon after school, my son and I were walking to the parking lot with our Executive Director. He asked my son, “Can you tell me three things you learned today?” I was struck by the seemingly simplistic question and marveled at the complexity of the mental process required to answer it. The metacognition to recall three things learned out of all the many other things happening during the day was difficult. It required thinking back to lessons and extracting exact information. With younger children, you may decide to ask them to tell you one thing. Or ask more specifically, what did you learn in zoology today? Not only does this focus your child on what they learned in school, but it shows them that you are taking an active role in their learning and education. One of the first tasks we ask students to do when they arrive in our Montessori classrooms each morning is to set their goals for the day. It is difficult, however, to check in with each child at the end of the day to make sure that they accomplished their goals. I know several elementary Montessori teachers who ask their students to complete a journal each afternoon to record what they learned in school. This journal becomes their “ticket out the door”. Before the students leave each day, they must complete a “3-2-1” journal. Children rarely do “nothing” in school. To find out exactly what happened in your child’s Montessori classroom, ask direct rather than vague questions. You’ll soon find out that your child is really doing a lot of work and you’ll be pleased with the increased communication between the two of you. © North American Montessori Center - originally posted in its entirety at Montessori Teacher Training on Thursday, October 30, 2008.